Waitrose & Partners is one of Welcome Break's retail brands, designed to mirror Moto's success with M&S Simply Food. Welcome Break previously trialled Sainsbury's at Birchanger Green but decided to leave that one there. In May 2009 Waitrose was trialled at motorway services as part of their own aim to expand their business. The two trial stores were the smallest of all Waitrose shops, but took a lot of space from WHSmith. It was expected to be very successful, and in September it was announced that nine more stores would be opening. In November 2016, Welcome Break introduced a West Cornwall Pasty Company range into all their stores, which was later removed. 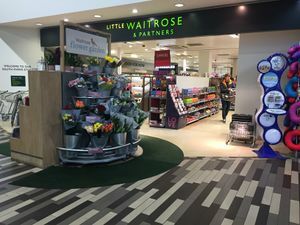 In 2017, Welcome Break began to use the name Little Waitrose, in order to match the rest of Waitrose's convenience store estate. Also during 2017 and early 2018, Shell started introducing Little Waitrose & Partners stores to some of their filling stations following a successful trial at four of their company owned-sites. Waitrose & Partners is a brand strongly associated with southern England. The Welcome Break store at Gretna is one of Waitrose & Partners' most northern sites. Little Waitrose & Partners are available at a few Shell stations.